In New York City, Steve Rogers and Natasha Romanoff are in a bookstore looking for humor books for the Vision. The Black Widow believes that reading will help the android find human emotions. Steve wonders why Victor Shade doesn't simply download the files. Natasha strongly argues that doing things in a human manner is better. Captain America jokingly suggests that maybe she needs to read the books. Suddenly, a man's body comes crashing through the bookstore's window! The two Avengers look out the smashed storefront to see the super-villain Deadpool running by and he is being followed by the bounty hunter named Kraven. Two blocks away, Nova is having a slice of pizza while trying to impress two women who are talking to him. The teenage hero's helmet communicator relays a message from Captain America that he is needed immediately. When he arrives, Richard Rider finds Kraven forced to the ground with Black Widow on top of him prepared to blast him with her bracelet weapon. Cap tells Natasha to let him up and he begins to question the bounty hunter. When Kraven realizes that he is talking to the Avengers, he instructs them to help him capture Deadpool. He informs them that as a licensed bounty hunter, all law enforcement authorities are required to aid him whenever possible. The star-spangled Avenger argues that their team doesn't take orders from anyone. Kraven points out that Deadpool escaped because of the Avengers actions. Steve Rogers agrees to assist him and begins making some phone calls. Fourteen blocks away at Carolina Pissarro's apartment, Tony Stark and the Vision are discussing how complex women are. Tony informs Victor that it is impossible to understand women because everyone is different. He believes it is more important to know the person you are interested in. Carolina walks over to the men and asks about their talk. The inventor of Iron Man tries to say that they were talking about the effects of abstract art on New York culture. The artist doesn't believe him and mentions she has hidden microphones in the apartment. The Vision isn't sure if she's joking or not. Tony thinks she is but tells Victor that he has a frequency jammer running just in case. The two Avengers receive a holographic message from Captain America who briefs them on the current situation with Deadpool and Kraven. Tony knows of Deadpool and warns Steve that he is a dangerous fighter. Cap asks his fellow teammates to be on call in case they need them. 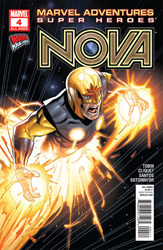 He feels the current gathering of Avengers can handle the situation and he wants to give Nova some more experience. Steve mentions that he's going to call Thor next. In Brighton State Park in Vermont, Thor is hunting a monster which has been spotted in the park. The god of thunder tells the Avengers' leader that the creature has been elusive. Steve Rogers tells his powerful friend about their run-in with Deadpool so he is updated on the team's location. As the Captain hangs up, Thor turns to find himself facing the monster he has been searching for all day. Back in New York City, Nova flies in to attack Deadpool who responds by throwing pretzels at him! The human rocket is caught off-guard by his foe's speed and finds himself knocked into oncoming traffic. Rich is quickly run over by a car but isn't injured. Kraven and Deadpool begin fighting in the street. The bounty hunter unleashes an electric net but it heads straight for a crowd of onlookers! Nova quickly grabs the net and removes it from the people. Captain America grabs Kraven and tells him to never shoot weapons into a crowd. Steve also informs him that if he says another word, he'll have the Black Widow shoot him in the foot with a stinger dart. Thor contacts Cap to update him that the monster has been defeated. The star-spangled Avenger mentions the escape of Deadpool and the thunder god suggests that he contact the Invisible Woman. He also advises his friend to do it before she finds out on her own given how angry she can get. Steve Rogers quickly agrees to call her. Twelve blocks from the Kraven situation, Sue Storm and Louise Mason are out shopping. Louise mentions she now runs a detective agency and they do both normal and superhuman investigations. Sue talks about how much she enjoys being with the Avengers especially Captain America. The Blonde Phantom points out that it sounds like the Invisible Woman is romantically interested in Steve Rogers. The invisible-powered heroine denies any sort of relationship between them other than being teammates and friends. Sue stops in mid-sentence when she notices Namor walking by them. The Invisible Woman is surprised that the Sub-Mariner would be in town and not call her. Louis suggests that her friend go over and simply ask him why he's in town. Sue Storm considers it but realizes Namor will only make up a reason for being in New York. Their conversation is interrupted when Captain America calls Sue. He tells her about the fight with Kraven and they are headed towards their position. She asks him if they are still planning on the sparring session later in the day. Steve hesitates and suggests they do it another time. Sue Storm is disappointed at the news. As she runs off to join her teammates, Sue hires the Blonde Phantom to follow Namor and report back her findings. Three blocks away, Nova grabs Deadpool and flies him into a building! However, the masked villain has superhuman healing abilities and quickly runs away. Meanwhile, Kraven throws a cab driver out of his vehicle and steals the cab. Captain America jumps on the hood only to find himself flung off the speeding car. Nova grabs and flies him to safety. Deadpool is about to be run over by Kraven when the cab runs into a large forcefield wall generated by the Invisible Woman. Cap calls another of the Avengers in for help and tells Kraven to stay out of their mission as the team chases after Deadpool. The agile villain runs into an alley that has no exit. He quickly grabs a fire escape ladder and climbs up the stairs. However, at the top, he finds himself facing Nova and the newly arrived Iron Man! As Deadpool gets bombarded by forcefield bubbles from Sue Storm, he jumps from the fire escape to the street. Before he can make his way through a manhole cover and into the sewers, the Vision arrives to block his path. The artificial Avenger makes his arm intangible inside of the crazed villain's chest and slightly solidifies it. Deadpool falls to the ground unconscious. As Kraven attempts to take his captive away, Captain America blocks his path. He tells the bounty hunter that he is under arrest for a number of law violations. Kraven the Hunter reminds Cap that the Avengers have no official status to apprehend him. Steve Rogers partially agrees with him. As he knocks Kraven out with a punch to the jaw, Steve informs him that he had officially made him angry!